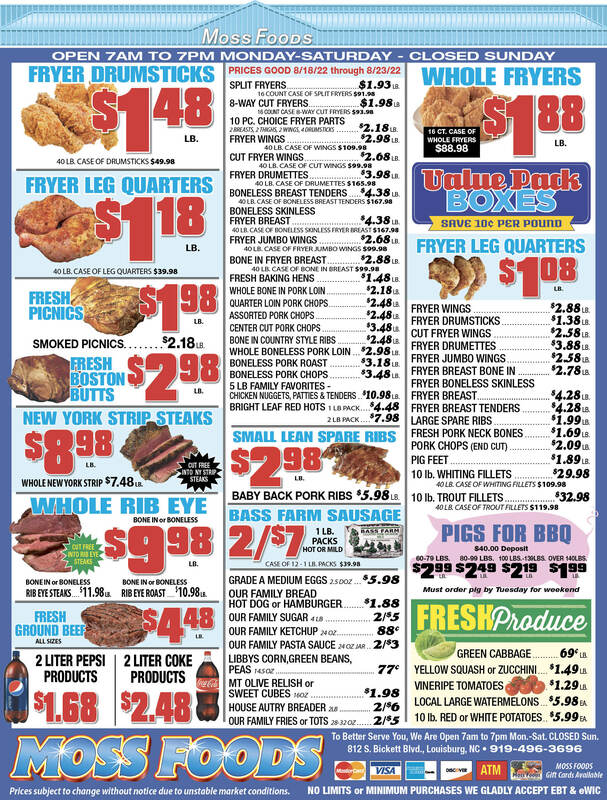 Showing 40 articles from February 15, 2013. FRANKLIN COUNTY — Dropped calls. Garbled audio. Missed transmissions. Those have been the words and phrases that officers have used to describe a new and improved emergency communications system installed by Harris Corporation. Those complaints have come from a number of law enforcement corners in Franklin County. LOUISBURG — If you’re not at the head of a waterway, you’re downstream. That position means that someone’s discharge is another man’s drinking source. As such, Franklin County and Louisburg are keeping an eagle eye on Creedmoor — not just because of their usual top position along the Tar River. This wedding: They’re lovin’ it! YOUNGSVILLE — It was certainly a Thursday that Peggy Killian and Harold Strother will never forget. And neither will their family and friends. And neither will folks who stopped by the Youngsville McDonald’s for a late lunch on Thursday. 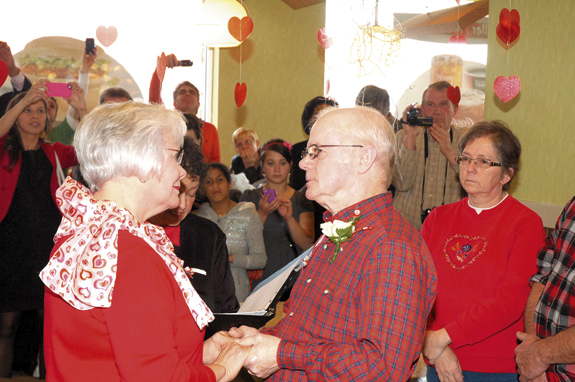 The couple, who met and fell in love at the McDonald’s location while playing Bingo, exchanged vows inside the restaurant on Valentine’s Day. LOUISBURG — The Franklin Parks and Recreation Advisory Board has called a special meeting in two weeks, hoping to finalize a proposal that prompts county commissioners to choose a park site. The board met during its regular meeting on Tuesday, revealing that there are still some questions about the three proposed sites that remain unanswered. KEY WEST, FLA. — A couple accused of trying to swindle North Carolina out of economic development money, and was ultimately arrested for defrauding a relative three years ago found themselves in trouble with the law, again. This time, Florida authorities arrested Robert Pearl and Tamara Asada, alleging that they were stealing from an employer. According to CNN news, a meteor streaked through the skies above Russia’s Urals region early yesterday (Friday) morning before exploding with a flash and boom that reportedly shattered glass in buildings and left hundreds of people hurt. It’s easy to understand — especially after the last four or five years — that what’s good for a few is often terrible for the many. 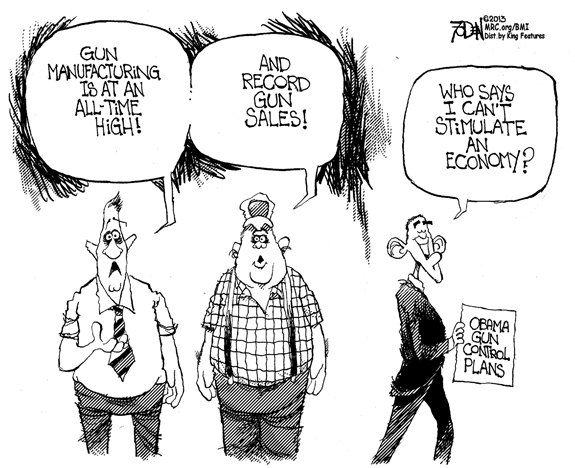 If the downturn in the economy that began about 2008 taught us anything, it’s that when one business (or government) does what’s in its own selfish interest, the effects can be damaging to other businesses or individuals. Looming debate on school safety, cost will entertain! One of the fun things about reporting on local government is the opportunity to watch as something goes from an idea to reality — and all the contortions that public officials go through to make it happen. With that in mind, it will be fascinating to watch the interplay between the Franklin County commissioners and the Board of Education in coming weeks. An editorial in Thursday’s Rocky Mount Telegram argues that Republican state lawmakers and Gov. Pat McCrory are making a big mistake by not using the federal money that is available to expand Medicaid. Why do my tax dollars not go to Youngsville as well as Louisburg? Not letting Youngsville have a hospital is pure greed. FRANKLINTON —Gerald Otis “Jerry” Tuttle, 72, died Tuesday, Feb. 12, 2013 at Rex Hospital in Raleigh. Funeral services were held Friday, Feb. 15, in the chapel of Bright Funeral Home, Wake Forest. Burial followed in Carolina Memorial Gardens in Creedmoor. ROCKY MOUNT—Doris Pearce Mullen Raper, 86, died Tuesday, Feb. 12, 2013 at Hospice Home of Wake County. Services celebrating her life will be held at 1:45 p.m. today (Saturday, Feb. 16) at First Baptist Church of Rocky Mount, with the Rev. Jim Alley officiating. The family will receive friends at the church from 12:30-1:45 p.m., followed by a memorial service at 2 p.m. Burial will be at Rocky Mount Memorial Park, 4454 N. Dortches Blvd., immediately following the memorial service. LOUISBURG - Carol Ann Baker, 73, died Thursday, Feb. 14, 2013. A graveside service will be held at 2:30 p.m. today (Saturday, Feb. 16) at Bunn Memorial Gardens. Family will receive friends Saturday from 11 a.m. - 2 p.m. at the homeplace. ZEBULON - Tony Lynn Curtis, 49, died Wednesday, Feb. 13, 2013, from injuries due to an automobile accident. Funeral service will be held at 2 p.m. today (Saturday, Feb. 16) at L. Harold Poole Funeral Service, Knightdale. Burial will be in the Bethany Baptist Church cemetery, Wendell. HENDERSON - Harriet Miller Ayscue, 84, of Henderson (Epsom Community) died Monday, Feb. 11, 2013 at Franklin Oaks Nursing and Rehabilitation Center in Louisburg. A memorial service was held Thursday, Feb. 14, at The Kingdom Hall of Jehovah’s Witnesses, Franklinton, conducted by Elder Kirk Taylor III. A private graveside service was held at Sunset Gardens. WASHINGTON, DC - Funeral services for Jerry Hopkins, 52, who died Friday, Feb. 8, 2013, will be held at 2 p.m. today (Saturday, Feb. 16) at Richardson Funeral Home in Louisburg, with the Rev. Carl Wardrett officiating. Burial will follow in the Haywood Baptist Church cemetery. BUNN - Frederick Hartsfield, 72, died Wednesday, Feb. 13. Funeral service will be at 12 noon, Monday, Feb. 18, at Gethsemane Baptist Church, Bunn. Interment will follow at Zion Springs Church Cemetery. 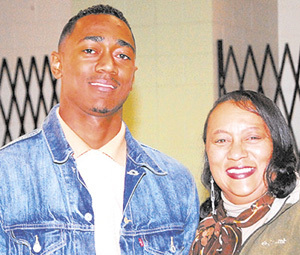 Visitation will be from 3-7 p.m. Sunday, Feb. 17 at William Toney’s Funeral Home, Zebulon. MATCHUP OF TITANS. 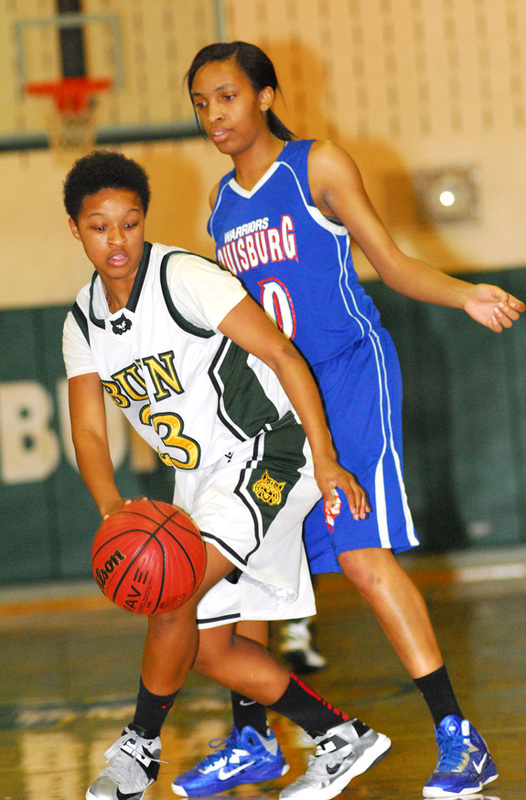 (L to R) Standout players Sedalia Seda (Louisburg) and Tainasha Vines (Bunn) try to gain possession during Tuesday night’s game. BUNN -- Coach Benj Daniels was handing out the ‘Thank Yous’ for a season well done to his Bunn High School players during Tuesday’s home girls hoops game against rival Louisburg. Most of the appreciation went to BHS senior point guard Whitney Bunn, who has still yet to lose a Northern Carolina Conference contest during her four years at the school. TREY-MENDOUS. 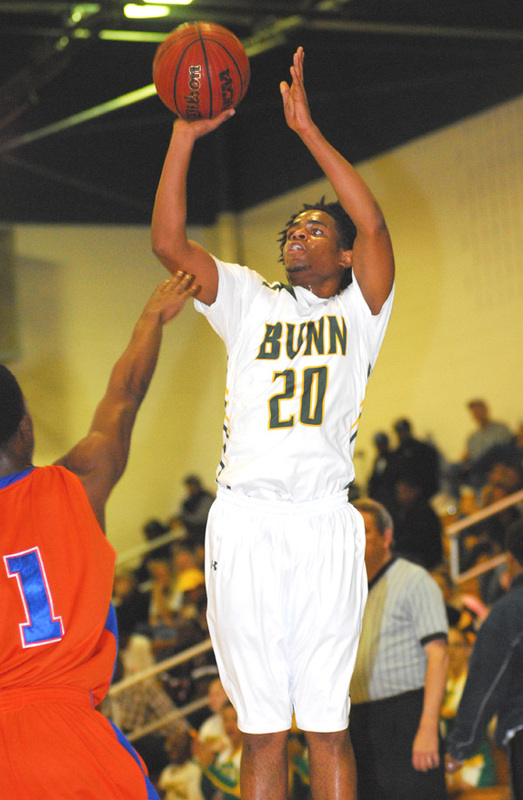 Bunn High School senior Javonte Perry cans a 3-pointer during Tuesday night’s home victory against rival Louisburg. 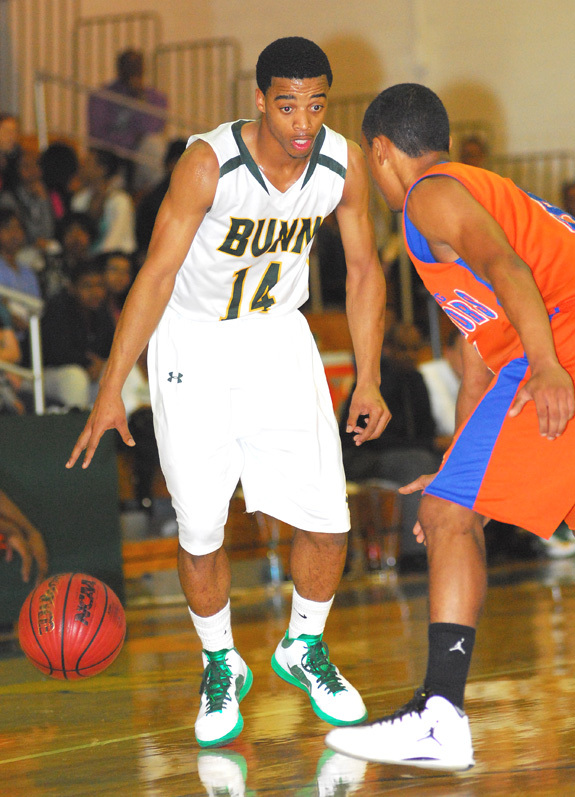 BUNN -- Bunn’s Wildcats will probably enter the Northern Carolina Conference Boys Basketball Tournament in a rare position -- as an underdog. The defending and several-time NCC Champions will finish in second place in the league’s regular season standings -- unless Louisburg scored a home upset Friday against league leader Corinth Holders (and Bunn defeated North Johnston). 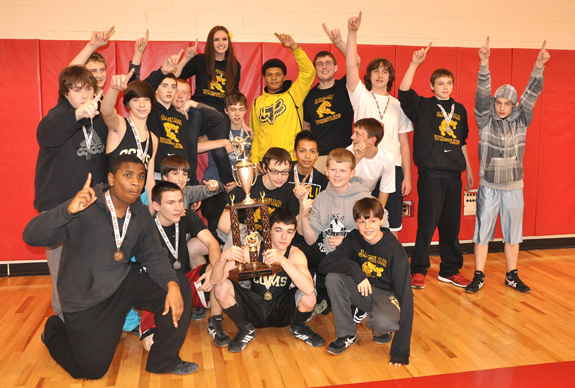 FRANKLIN COUNTY -- With the Class 2-A State Playoffs now completed, Franklin County’s wrestling squads will now focus attention on the upcoming East Regionals. That individual-format event will be held beginning this coming Friday at Farmville Central High School in Pitt County. For the first time in three years, the Northern Carolina Conference Basketball Tournament will be stepping out of Franklin County. Bunn (2011) and Franklinton (2012) hosted the event the past pair of seasons, but the site has been switched to the spacious gymnasium at Corinth Holders High School in Wendell. YOUNGSVILLE -- Cedar Creek left little room for opposition debate in its quest to sweep through the Middle Athletic Conference in the 2012-13 season. The Jaguars, coached by James Smetana, posted an unblemished 17-0 record en route to winning the MAC’s regular season and tournament championships. RALEIGH -- Louisburg College has accomplished a string of heroics during its 2012-13 men’s basketball season to date. But it was the lone low point of the campaign that weighed the heaviest on the Hurricanes during Wednesday’s rematch trip to Wake Tech. HENDERSON -- The Vance-Granville Community College golf program will take students around the Carolinas during the 2013 season, the first season under Coach Bobby Paff. VGCC Vanguards golfers are set to compete in at least nine intercollegiate matches or tournaments this spring. 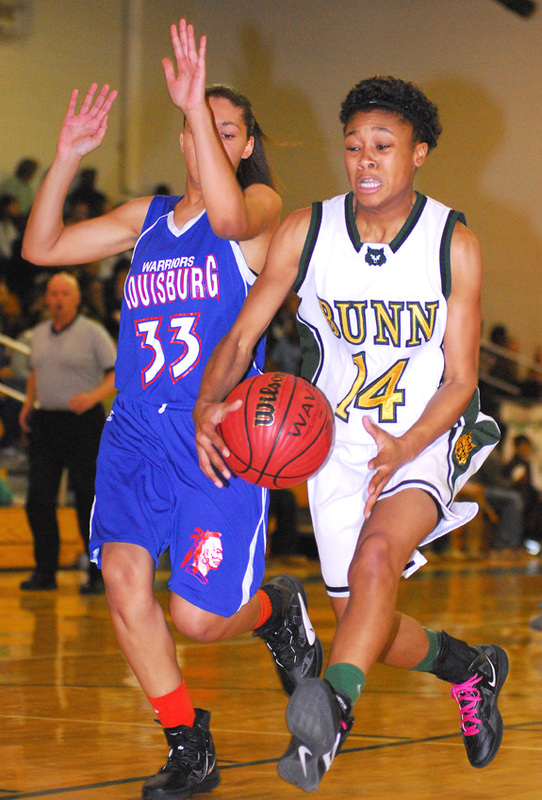 Bunn’s Precious Walker (left) tries to avoid the defensive pressure of Louisburg’s Alkia Johnson during Tuesday’s girls basketball matchup. 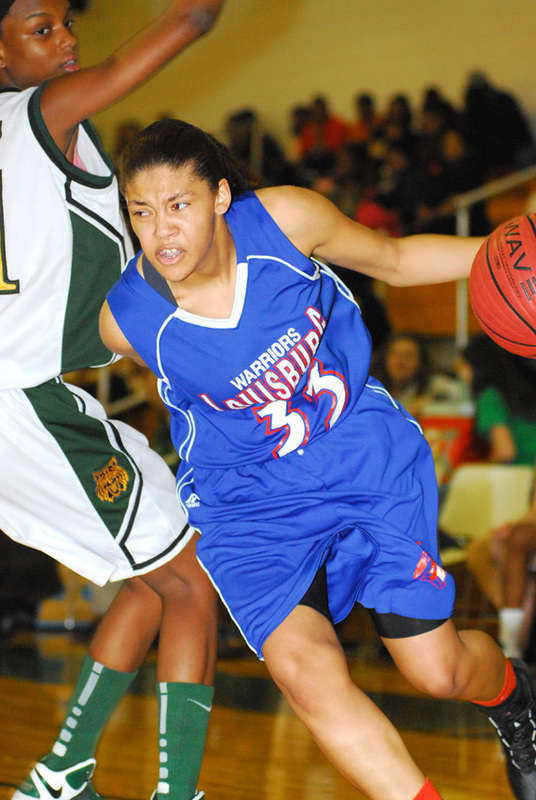 Louisburg’s Sedalia Seda (right) drives the baseline during Tuesday’s road loss against Bunn. Bunn’s Deshawn High (left) prepares to utilize his trademark slide-step move during Tuesday’s home decision against the Louisburg Warriors. 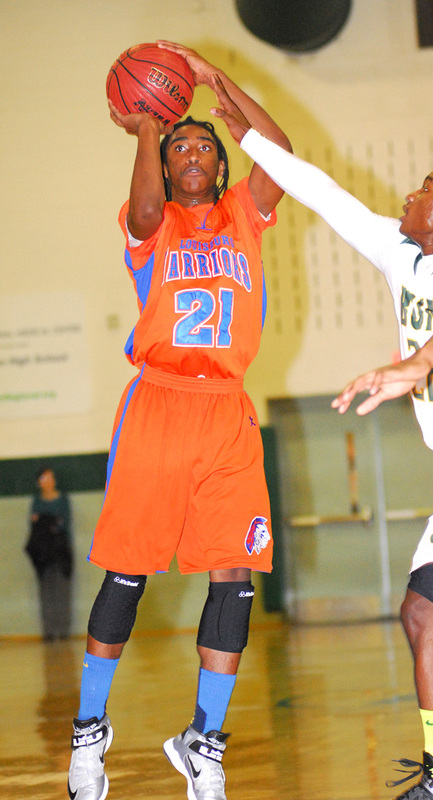 Guard Sterling Hartsfield (shooting) has enjoyed a strong campaign in 2012-13 for Louisburg High School. Louisburg College has the honor of exhibiting an unusually beautiful collection of photographs done by David Simonton. “I love the little towns, the country roads, the dusty rail lines and crossroad garages,” says Simonton, speaking of his favorite places to photograph. 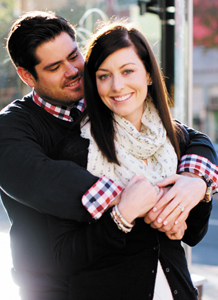 Stuart D. Coward V, “Quint,” and Brandy Leigh Barrett announce their engagement of Aug. 25, 2012. 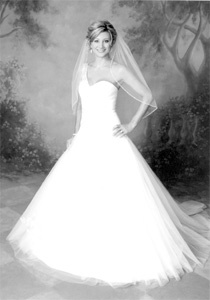 The bride-elect is the daughter of Jean F. Barrett and the late Robert H. Barrett II of Pinehurst. The groom-elect is the son of Stuart D. Coward IV and Teresa M. Coward of the Pilot Community. A June 8, 2013 wedding is planned in Pinehurst. Ashton Carol Piper and Jared Darwyn Webb were married on Sept. 8, 2012 at 5 p.m. at Triple R Ranch in Franklinton. The Rev. 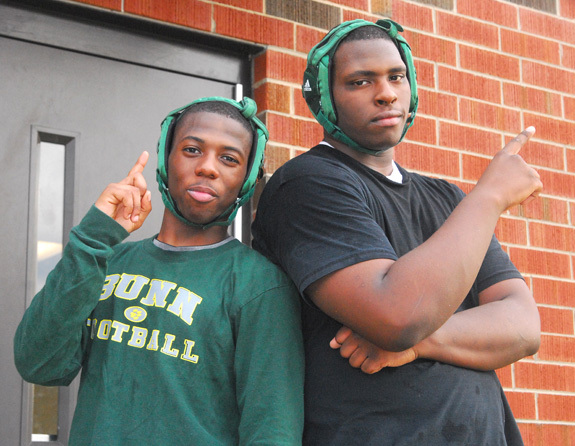 Marcus Redding and the Rev. John Ridley officiated the double-ring ceremony. Following the wedding, a reception, hosted by the bride’s parents, was held at Triple R Ranch. 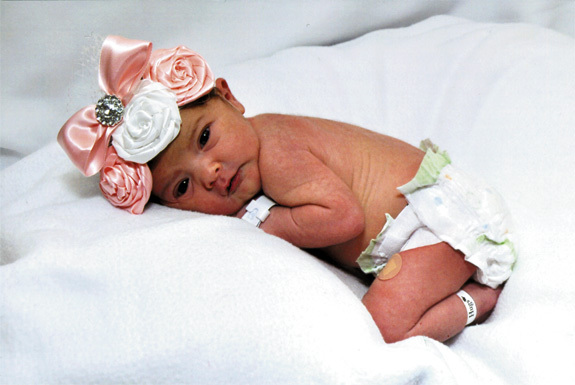 Blake and Brooke Fox of Kittrell are proud to announce the birth of their daughter, Paisley Blake Fox, born Dec. 27, 2012 at WakeMed Hospital in Raleigh. She weighed 6 pounds and was 19 3/4 inches long. Maternal grandparents are Irvin and Tammie Piper of Franklinton Paternal grandparents are Hugh and Teresa Fox of Kittrell. 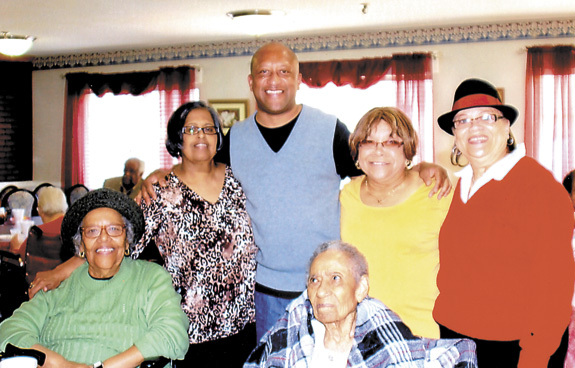 Mary Louise Hill of Louisburg Nursing Center was honored on her 102nd birthday by her nieces. The honoree was presented with a corsage and received numerous cards, flowers, balloons and gifts. Church members, former students, family members, friends and nursing center residents were in attendance. Refreshments were served, including the birthday cake, which was compliments of Gaynell Thomas-Jones. It was the family business. Tom began working there as a child and was responsible for it now that his parents were in their 80s. He took his work seriously from sun up to sun down. Tom’s family name was on it, and his blood, sweat and tears went into every aspect of the business. FRANKLIN COUNTY — Issues with the county’s radio system have caused law enforcement agencies to rely on their own cell phones for better communication. Late last year, county staff and consultants for a $10.6 million radio project upgrade acknowledged that the system had some bugs that needed to be worked out. NASH COUNTY — Four Franklin County residents, including one who led police on a foot chase before being subdued with a Taser, were charged with narcotics violations during a checkpoint. Deputies with the Nash County Sheriff’s Office were checking for licenses at along N.C. 231 and Frazier Road when the suspect vehicle approached, according to authorities.